Create animated Application Landscape diagrams yourself starting with a Trial Account here. Take a peek at the Dragon1 Step-by-Step Guide. This example Application Landscape Diagram was created here on the Dragon1 Platform. What is an Application Landscape and why is it so important to have? 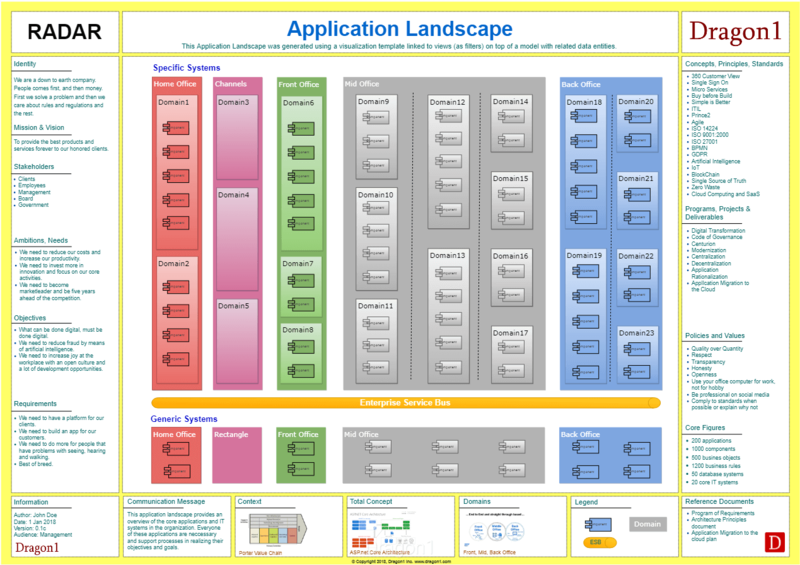 An application landscape poster (A0 sized) is a logical functional and/or physical technical overview of all the software applications in the information systems and their interfaces and connections in an organization. An application landscape is a perfect visualization for managing the costs and complexity of your applications. In many organizations there are hundreds, and if you count all unofficial spreadsheet-apps with it, thousands of applications. And everyone in the business relies on them. In the current time of fast-changing needs, lots of applications are replaced, updated, integrated and connected. So in order to keep your business going you need to know beforehand what the impact is of changing a certain application, made visible with the landscape. Having a printed poster or digital application map available is of great value. How to create an Application Landscape diagram? An application landscape is often created by quick scanning the installed base, doing interviews with users and workshops with management. This gives a start for an overview of all the applications. 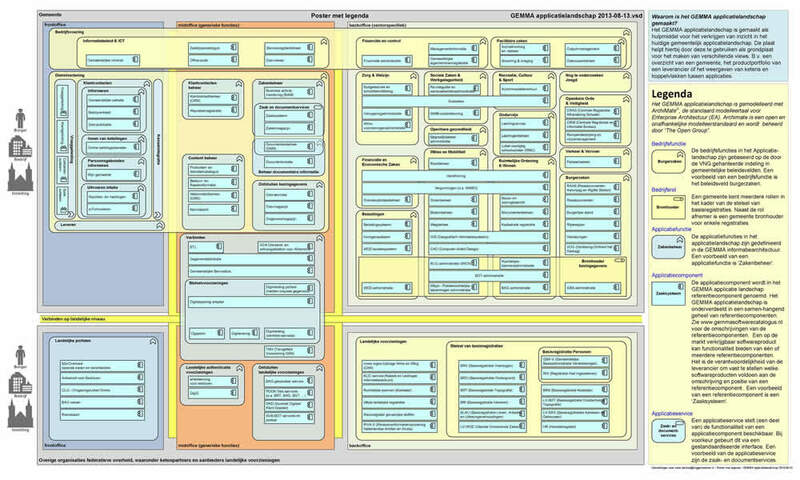 Next, a process is implemented to keep the application landscape diagram overview up-to-date. The application landscape can then be used for decision making and impact analyses of change. Dragon1 EA Method proposes to create an application metamodel and take time to carefully define the types of applications and the core functionality of the applications. This allows maximization of deduplication. Dragon1 is the most suited software available for generating an application landscape based on information in a CMDB-tool. A solution in which often application landscape diagrams are used is Application Rationalization Deduplication. All applications that duplicate functions are if possible phased-out or switched of. The objective is to lower the complexity of the application landscape diagram and to average application cost. Read the case study Application Portfolio Management at a Bank. Blogs > What are Top Priority Views to create of your Application Landscape? Do you want to start immediately? You can purchase your Dragon1 PRO user license online via Paypal.